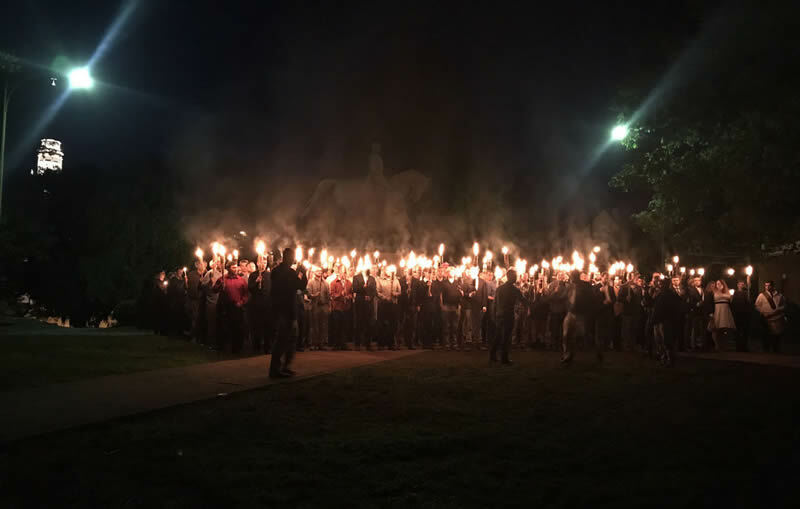 While I’ve been in Russia trying to make friends, back home in Charlottesville, Virginia, USA, a group of torch-bearing supporters of Robert E. Lee has held a rally generally understood as a proclamation of white supremacy. I’ve previously written at some length about this white identity group, their humanity, their legitimate grievances, and their support for Donald Trump. They chanted: “You will not replace us!” possibly because the city of Charlottesville has decided to replace a statue of Robert E. Lee with something less racist. They chanted: “Blood and soil!” I suppose to express their lengthy connection to the land (although their leader is no more from Virginia than Robert E. Lee is from Charlottesville), or — less charitably — just because of the flagrantly fascist sound of the slogan. If the relevance of that last one confuses you, I am very pleased to hear it. Both camps accept on the basis of no evidence whatsoever that Russia helped put Trump in the White House. Both camps are perfectly open to building up hostility toward a nuclear-armed government, but only one camp has been instructed to do so at this time for partisan reasons. I mentioned this state of affairs to some Russians, and one replied: “But we never even had slavery, only serfdom.” Regardless of how important that distinction is, this misses the point. There’s no logical connection between liking Russia and wanting a city in 2017 to be dominated by confederate statues erected for racist campaigns in the 1920s. I’m not committing any fallacies by favoring some changes in Charlottesville’s landscape and favoring U.S.-Russia personal and governmental friendships. I toured Moscow’s Gulag Museum today. I saw no crowd of gulag supporters proposing friendship with the United States. But such a display would hardly have been observable as such, since every single Russian I’ve ever met has proposed friendship with the United States — including Russians with a wide range of opinions about the gulags.